We discuss how we go about the design process; making your house yours. Our in-house design staff is ready to work with you to define your goals and develop a budget. How can we best situate your home on the site, taking into consideration views, light, and access? What kind of home do you want to live in - one with soaring ceilings and an open floor plan, or one with smaller cozy rooms, or a combination of the two? We want you to have the house that suits you perfectly. We provide a site analysis and preliminary drawings for your review. We help guide you through the decision-making process as you choose mechanical and electrical systems. We work together with you every step of the way. After you have had an opportunity to modify and refine the preliminary concepts, we develop complete working drawings for your project. Site and surroundings are fundamental elements in the effectiveness and appeal of your house, cottage, or barn. A careful site analysis is necessary to maximize the natural assets of your location and to minimize potential problems during development. In a manner sensitive and responsive to the site, the structure, and the residents, we carefully plan each building to take the fullest advantage of its connection to the land, its inherent and surrounding beauty, and its solar potential. Rockport Post & Beam offers you a choice of building options. 2. or The Frame and Panel System, which is the frame sheathed with energy-efficient insulating wall and roof panels. Either package is available throughout New England. 3. We also can provide what we call a "finished shell", which is the frame sheathed with energy-efficient insulating wall and roof panels plus completely finished on the exterior. 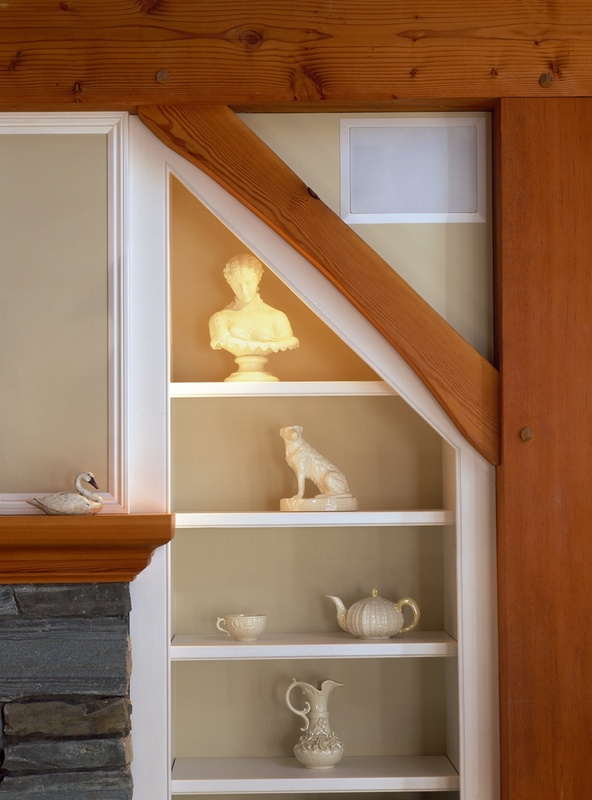 The Finished Shell System is available within a 40-mile radius of Rockport, Maine. Whichever option you choose, our in-house design team is on call to guide and help you. We begin working with you to develop a custom design. We undertake initial studies of floor plans, building elevations, and cross-sections that will help you envision the size, look, and feel of your new home. Also included at this stage are site visit(s) and analysis and a series of preliminary studies and meetings to help define your goals and budget. We'll provide you with guidance in choosing windows and doors, heating, electrical and plumbing systems. We'll help you decide about special additions, like a sunroom or family room, and assist you with passive solar technology. -$1,500. for homes up to 1,500 sq. ft.
-$2,500. for homes 1,501 - 2,500 sq. ft.
-$3,500. for homes over 2,501 sq. ft. These costs are based on average drafting hours. If required, additional drafting time to conclude Phase I will be invoiced at $45.00 per hour. We develop a full set of architectural drawings from the studies done in Phase I: final floor plans, with electrical and plumbing details; all building elevations; foundation and deck plans; and cross-sections. Three full sets of blueprints are included. Additional sets are available at $30 per set. -$2,250. for homes up to 1,500 sq. ft.
-$3,250. for homes between 1,500 - 3,000 sq. ft.
-$4,250. for homes over 3,000 sq. ft.
-100% of the Phase II design fees will be credited towards the purchase of your home. -Our contracts for the purchase of your home incorporate a progressive time and payment schedule. -A building deposit of 10% of the contract amount will reserve a time slot for you in our schedule. -Design fees are subject to change.